"The ideas in this book are key to creating the kind of enterprise that will create hundreds of thousands of jobs in the future. 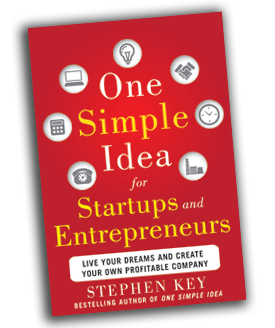 The goal of entrepreneurship is to reduce the risk of failure as detailed in this book." – Nolan Bushnell, inventor of Pong and founder of Atari, & rightly considered the father of electronic gaming. How to Turn Your Simple Idea into a Million Dollar Business without writing a business plan, going deeply into debt, or giving up control of your idea. One Simple Idea for Startups and Entrepreneurs is for anyone who wants to bring their idea to market themselves, taking the easiest, safest, fastest route possible. It also shows you how to navigate all the potential road blocks and detours as well as show you some shortcuts along the way. Here is what others have to say about One Simple Idea for Startups & Entrepreneurs. "Kudos!! One Simple Idea is brilliant !! A must read for those that have the courage to dive into their dreams. This is a true Road Map for those that have the passion to achieve their Freedom. Truly something that I wish would have been there for me 33 years ago." – Gene Luoma, Inventor of Zip-It Clean. Over 15.5 Million people’s drains unclogged with Zip-It (zipitclean.com). "The world of Invention is filled scam artists and cheats. Advice is everywhere but good advice is very rare. Stephen Key is the exception. Solid information and a friend to inventors. Stephen is one of the good guys." “Stephen Key is the real deal. Without his knowledge and willingness to share it, I would not have been able to successfully bring my own product to market. Now readers of his book have the same opportunity to benefit from an education in start ups and just how true it is that all it takes is persistence and one simple idea." Access to our New Database full of grants and capital funding companies, interviews with experts, trade shows, manufacturing companies, graphic artists, industrial engineers and much more. Three - one hour online classes on "Starting Your Business with your Idea"
How to patent search like the pros. Learn how to find prior art. Learn how to design a winning sell sheet. Create eye catching sell sheets for your ideas. Sign up for the book club above to get details when special events will take place.